What file type should I use? Files shoud be PDF - CMYK - 300 dpi. 1) How do I set-up an account? Setting up an account is quick and simple. To get started, click the Login/Sign Up button at the top on the Tool Bar. Next you'll see our Registration Form. Complete the set-up process by simply filling out the Registration Details Form and clicking the register button when you're done. Your account will be Active. 2) What is the new HST and how will it affect me? Due to the new tax laws that took effect July 1 2010, all Ontario orders are now subject to HST(13%). 1) What File Format should my file be? We strongly recommend you prepare your file as a High-Resolution PDF File with Bleed. 2) What Colour Mode should my file be? Your files should always be in CMYK, anything else may result in a colour shift when other colour modes are converted into CMYK. For best results, the design file should start off as a CMYK colour mode. 3) What resolution is preferred for final artwork and images? The preferred resolution for images and artwork is 300DPI. 4) Is there is a size limit for my artwork files? We ask that all artwork files have a maximum file size of 250 megabytes. This is to ensure that there are no delays in your turnaround due to file retrieval and processing time. If your file is larger than 250, we recommend compressing and optimizing your file. If this is not possible, please provide us your file via CD, DVD, USB flash drives or another form of storage device. 5) Ensure1/8" bleed is included in your file. A 1/8” bleed is required on all four sides of your artwork. Bleed is extended artwork on all sides of the artwork to allow for cutter variance. Items such as background and design elements should always extend out of the trim margin. Failing to provide bleed information and crop marks can result in the printed product showing a thin area of white on the edge. If your file does not consist of bleed, it will be rejected by our prepress department and we will request for a new file with bleed. This can result in delaying the completion of your job. 6) All important text and images must be within the safe margin(1/6" away from trim mark). Safe Margins are 1/16” away from the cut line. Safe margins are guidelines that help you keep important elements of your design away from the edge of your artwork in order that text and images will not be cut off when trimmed down to the final size. 7) All images must be embedded and all type must be embedded/outlined. The file you upload to SinaLite must have font/imaged embedded or outlined in order to properly process your file. Choose the image you want to embed from the list and click on the arrow and select "Embed File". Choose the image you want to embed from the list and click on the arrow and select "Embed Image". Select your text box. Under the Type menu select Create Outlines. For products such as business cards, we would recommend customers to avoid borders. If the border is too close to the cutline, it may results in the final product to be off-centre slightly. 9) FIles are backed up for proper orientation. In order to ensure files are submitted properly for proper orientation, we will require files to be submitted HEAD TO HEAD. Aysprinting also requires to have files submitted as one file, for example, a one sided file should consist of 1 PDF, one page, and two sided file should consist of 1 PDF, 2 pages. 10) Check Files for overprint issues. Overprinting refers to the process of printing one colour on top of another. If you do not want this to happen make sure that the overprint options are turned off and switched to knockout in your document. Below, the file was not switched to overprint, even though the white text is showed on screen, when printed, the white text did not show up due to overprint issues. Please note that our file preview does not display overprint issues, therefore, it is critical to check your file for overprint issues before uploading the file to us. 11) Transparency Issues with PMS colors. Transparency effects are generally not preferred in printing, and only on screen. It causes ripping issues and elements to disappear. To prevent this, do not use any shadow, glows and transparency on top of a spot colour – always convert your spot colour to CMYK before using any transparency effects. 12) Rich black and Total Ink Coverage. We will always require 100% K for black text (C0, M0, Y0, K100). Rich black should not be used for type or thin lines because it will result in fuzziness and misregistration issues. Vector images use mathematical equations to define each component of an image. This allows vector images to retain their high-quality at any size. Programs like Adobe Illustrator, Corel Draw, or Adobe Freehand uses vector graphics. Vector images should be used for all text and logos if possible. They result in the clearest image and can be re-sized without losing resolution. A raster image is composed of a collection of tiny dots called pixels. When these pixels are small, and placed close together, they fool the eye into forming a single image. Raster images work great when subtle gradations of color are necessary. Because they contain a fixed number of pixels, a major disadvantage of raster images is that their quality suffers when they are enlarged or otherwise transformed. We would also recommend fonts and logos to be vector for print with maximum clarity. 17) Can u print form field data in my PDF? We highly recommend not including any form field data in your PDF file. There is a likelihood that the data or text will not print out correctly on the finished product. 1) What is the low-res preview? The low-res preview is to ensure you have uploaded the correct job. This preview is not a proof, meaning, it has not been preflight, ripped and does not simulate any overprint issues. 2) How do I specify shipping? UPS is our shipping courier. Please provide an address for delivery and choose a shipping service. Available shipping services include UPS Ground, UPS Express and Local Pickup. 3) How do I pay for my print work? You can view all the billing information before placing the order. Verify all relevant information, check off that you accepted the terms and then click on “Place Your Order.” This brings you to where you can fill your credit card information to complete your order. Payment can be made using either Visa, MasterCard or American Express. 1) How do I change my personal account information? Click on “Manage Account” on the left hand bar – there, you can change all your personal contact information such as Address and Phone Number. 1) Which Shipping service do you offer? We ship with UPS and offer two types of courier service – UPS Standard and UPS Express. 2) Can we split ship jobs to different locations? Each job can be shipped to only one location. 3) Which locations do you ship to? We can ship to any location within Canada and USA. 1) What do I do if there is a problem with my job? 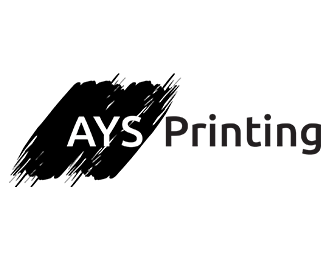 If there is a problem with your printed job please contact us at support@aysprinting.com.In your email please include the job number and a description of the problem. If needed, we may request a picture/scan of the product for visual quality control. After we have received your email, a representative will contact you. 2) How do I make a request for a custom size? If there is a certain size that is not available on AYS Printing, you can request a custom size by following the steps below. 1. Place the order as the next biggest size available on SinaLite. 2. Upload your file with the correct custom size dimensions with trim marks. 3. Email support@aysprinting.com with the job number and the correct trim size, and we will manually adjust the size for you. If this custom size is not possible, a representative from AYS Printing will contact you before we process the job. 3) How do I contact production about special instructions regarding my job? Contact support@aysprinting.com with the job number for special instructions regarding jobs. If the special instructions are not possible, a representative from AYS Printing will contact you before we process the job. However, we will recommend contacting 1-844-AYS-8448 customer support in regards to whether these special instructions can be accommodated before placing your order. 4) How do I make changes to my order after it has already been placed? Due to the automated system that we use, you may or may not be able to make changes to your order. If your order has already been imposed or plated, we will be unable to make most changes (i.e. artwork, size, stock, etc). To request a change, send an email to support@aysprinting.com with your changes. Include your order’s item number and we will try our very best to make the change. 5) What happens if my file is rejected? After submitting your job to AYS Printing , the file will go directly to our prepress department for preflighting. If our prepress department has confirmed your file is not printable, they will reject your job and an automated email will be sent out to you requesting a new file. You must ensure you have entered in the correct email address in order for us to contact you. The email will provide a link allowing you to re-upload a new file under the same job number. Please do not reorder your job as a new job. 1) Can you guarantee flute direction for Coroplast Signs? By selecting the H Stand Ready option, we will produce your signs with vertical flutes to facilitate the use of H Stands. If the H Stand Ready option is not selected, your signs will be produced with either vertical or horizontal flutes. Requests to guarantee horizontal or vertical flutes may incur additional charges. 1) What is the general tolerance for the positioning of the spot UV? Positioning of the spot UV cannot be 100% guaranteed. Please note that there may be a shift of approximately 1/8” in the spot UV position on the printed product.